One of the best thing for any developer is to write a code which can be used as many times in an enterprise application. Pipeline templates is one of such capability in Oracle Service Bus in which developer create a prototype of a pipeline called as pipeline template and include all the component which can be use across the enterprise services. One such example can be a Error handler. As you can see these are the common components which can be used across all the Services in OSB. Let me start with the basic. 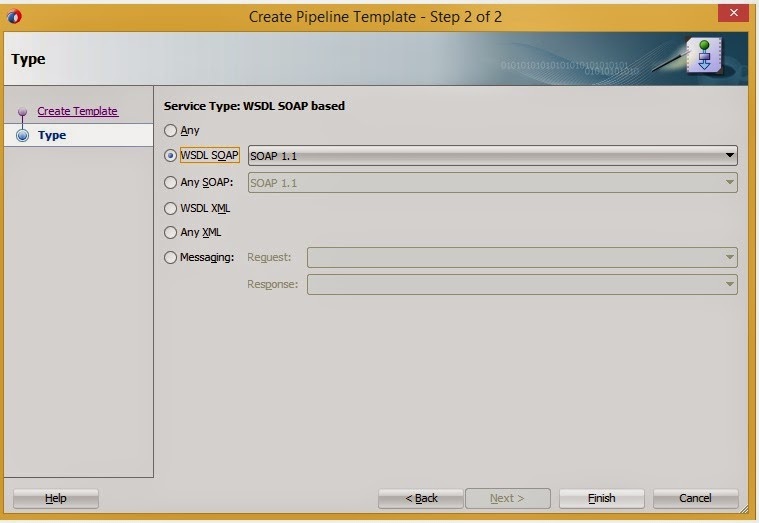 Pipeline component in OSB provides message processing capability i.e. defines logic for routing, validation, manipulation of messages (transformation) or error handling etc. Start Node: It is a by default node define automatically when you connect to proxy service. Pipeline Pair: node for request & response pair processing. Branch Node: node to route the message based on condition either on type of operation or values. Route Node: this node set the destination of message otherwise by default echo the request i.e. request is passed to the response. Error Handler: handle errors either on stage or node. Note: Minimum start node and route node required for pipeline. A template in pipeline is a prototype of message flow for proxy services. It defines the reusable activities that are common across the business process for example validations on business messages, error handling, transformation of request and response messages etc. 2. Template wizard appears, Enter all the information. 3. Click Next to select service type. Note: you cannot create pipeline templates in OSB console. Two projects i.e. SharedSB and ConsumeTemplate. SharedSB is project in which we store all the common resources that can be used in all the service bus application and In ConsumeTemplate I will create a pipeline on the basis of pipeline template. Drag and drop all the components that you think can be re-used in many services. In this case I am using Validity, Error handler, reports, logging, Alerts. After configuring all the activities, you can lock the activities so that the same configuration can be used in all the concrete pipeline i.e. in the pipeline where you are importing the pipleline template. 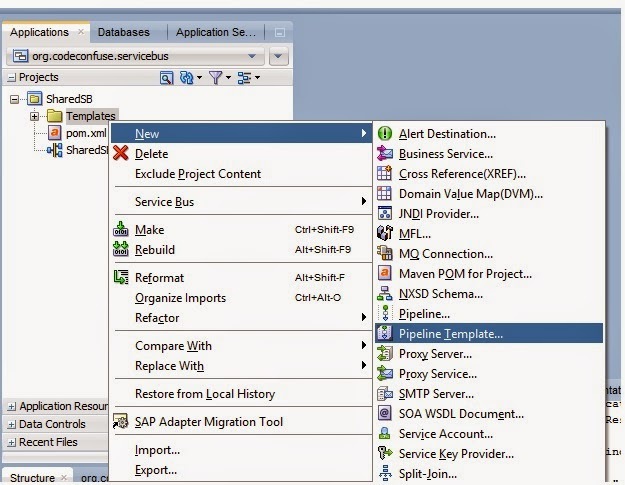 Create pipleline using the template and use same signature as of your proxy service. After importing template, implement message flow logic if required. 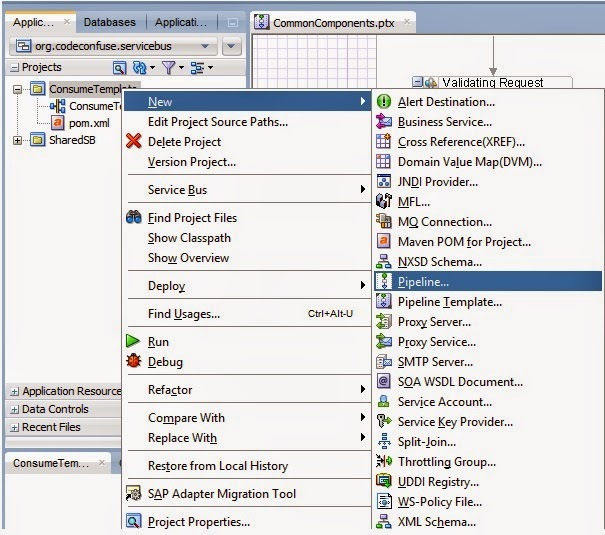 Save and deploy both the projects SharedSB and ConsumeTemplate on Oracle Service Bus server.